This motorbike tour is for people looking for an insight into the rural life of Tibet with a great view of the Trans-Himalaya and beautiful temples and monasteries. Our motorbike tour will take you around Trans-Himalaya Nepal & Tibet, giving you an insight into the life and culture of Nepal & Tibet. Come and enjoy some of the best riding in Asia. 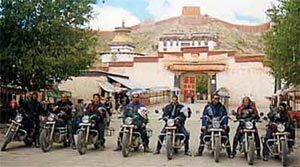 Ride with us and we are going to show you Tibet. Are you curious about how life is on one of the world's most isolated places, with an average altitude above 10,000 feet, yet still with mountains towering over you? 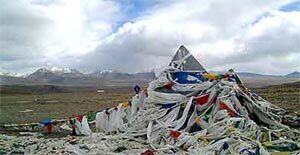 Then you should participate in our "Roof of the World Expedition" following Highway 109 to Lhasa. The Chinese Liberation Army built this roadway approximately 50 years ago. The mountains are rough with beautiful rock formations and the environment seems dry as a bone and still you will see nomadic Tibetan people herding sheep, goats and yaks. A motorcycle guide together with a support vehicle will provide you with the maximum safety during this unique adventure. When evening comes, Chinese and Tibetan cuisine and hospitality beckon. The multi-language tour-guides will provide you with the ultimate experience in this unique culture. For this tour, you should be very sure that you are a good motorcycle rider and that you are willing to cover extreme mountain passes up to 17,000 feet on some long riding days. You will experience many winding mountain roads (some paved, others only gravel) along desert dunes and snow-covered peaks. Riding two-up is not possible on this tour. If you want to bring a partner, we can accommodate some passengers in the support vehicle.